Every where I look lately I see everyone drinking these electrifying, neon green smoothies that look more space drink than something you’d drink for a cleanse, or simply to get your veggie intake in for the day. But that’s exactly what these drinks are and what they do. They feed your body with nutrients that often our diets neglect. Today the plate is often composed with all the wrong proportions of the food groups you need to form a healthy diet (and no we are not talking some fad used to get skinny; diet: n. – selection of food.). Fruits and vegetables rarely make it into a typical American diet, what with all the carbs and protein people seem to have forgotten about the most essential of nutrients that are bodies can ingest. It’s maddening, really. The solution for many, like all American solutions, combines a lot of veggies and fruit, ya know the nutritious stuff, with some other things, dairy, to make this fast drink that can be gulped down (trust me you’ll want to gulp this down). 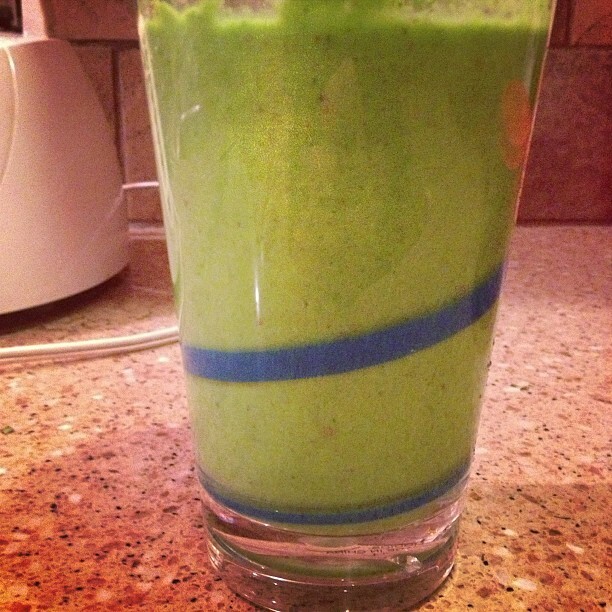 Let’s recap real quick, the green smoothie delivers nutrients in a fast, fairly efficient, manner. Little clean up is needed and the recipe ideas can be endless if you have just a little bit of creativity in your bones. After seeing all kinds of recipes and not really knowing which I would like or what I should try first I decided to do things my favorite way possible, my way. Gathering all the knowledge I have received from Pinterest and Facebook shares, and recipe blogs I was fairly confident I could come up with something, if not with a little trial and error. It’s not rocket science to make something healthy, but to make it tasty… that’s another story. Listed above ^ are all the ingredients I wound up using in my super awesome mega green monster machine smoothie. I started out with placing in my blender the kale and spinach, after that I dropped in the mango, apple, celery, chia seeds, greek yogurt, and a little milk. Once all that blended itself into a liquified state I added in the blue agave and honey. Gave the blender a quick whirl and poured myself a test glass. Let’s just say if you’ve ever eaten a few blades of grass when you were a kid you’d know exactly what this tasted like. What did I do? I added some orange juice and a banana. Those two simple additions made the drink completely tasty and bearable…for the first 3 or 4 sips. This is a health drink, it’s meant to cram a lot of nutrients into a simple, easy to consume, glass of awesomeness. It does just that but of course like most things that are good for you it lacks the taste to keep you coming back for more. So I am reaching out to all of you, how would you improve this drink? What would you add to it to make my tastebuds dance with joy? Share your recipes, let’s make the most awesome green drink ever! Except for the fructose syrup (Agave), GREAT!